Together with the El Campéon layout, the 18-hole Las Colinas course forms a formidable 36-hole test of golf at the Mission Inn Resort & Club. Las Colinas was added to Mission Inn in the early 1990s. Most consider it the easier of the two courses and I concur, but at over 7200 yards from the tips and water on 15 holes it is a good challenge The first hole is welcoming. A what you see is what you get par 4. The 2nd is a mcgilla. A 200+ yard par 3 over water with 4 bunkers behind the green, amazingly this is the number 18 handicap hole! The par 4 4th is demanding, tight fairway, ob left and prime Floida swampland right. The 4th hole requires a crisp approach shot as the green is long, narrow, double tiered and protected by a swale on the right and bunkers on the left. I loved the par five 5th (yes, I birdied), a slight dogleg right, I would suggest favoring the left side off the tee to give you the best angle on your second shot. Pick your wedge distance carefully, there is water in front and this green has 3 tiers. The par 4 7th is a birdie oppty, however long hitters beware of the pond on that left that is about 130 yards out. The 8th is a long par 4. The fairway hourglasses in the landing zone and about 100 yards out. Don’t splash it right. The 10th is a slight dogleg right with OB down the right side. This hole has a plethora of fairway bunkers on both sides. The 11th is obligatory Florida par 3 with carry over water. Back to back par 5s, 12 & 13. The 12th is quite short but also quite tight. The right side off the tee wil give you the best green light oppty. This is another fairway lined with bunkers. The 13th is a tough hole and the number one handicap. I would recommend favoring the right side off the tee. I can only envision a few getting home in two, so pick your favorite wedge yardage. No rest for the weary, 14 is even tougher. At 497 yards it is longer than the par 5 12th. A big dogleg left, to really have a shot at the green in two you must cut the corner over the swamp, but don’t’ get too greedy. The 15th is a 236 yard par 3 from the tips with the smallest green on the course. The 16th and 17th are long par 4s and are rated the 17th and 15th easiest. I don’t get it, The 16th is 420 with water left and the 17th is 417 and your approach from just about anywhere in the fairway ust carry water. Regardless, 17 is a pretty hole. In an unusual configuration, 18 is the third par 5 on the backside. The fairway is bisected by gunch about 250 yards out, so big hitters be wary. The rest of us just have to be wary to hit our second shots over it! A good finishing hole. Heck, the last 7 holes are top notch. The Mission Inn resort is a little way out of Orlando, about 45 minutes north-west and may not be a natural choice for holidaying visitors but I would certainly say why not? I would like to give the resort and courses a recommendation here after playing both. Las Colinas has been around since the early 90's and the one of the stand out things for me was that the course started well and remained consistent throughout and to be honest became very strong on the back nine. The opening hole is pretty straight but with water in play down the right side, means that there is some pressure on the first shot of the day. A 220+ yard (back tee) par-3 over water is the 2nd hole and from that tee is not for the faint hearted. The pick of the front nine for me is the par-5 5th hole, well within reach for many as this is only 500 yards from the very back tee dropping to around 430 on the front (Gold) tee. The big issue though is that the hole has a big left to right dog-leg and water in front of the green - risk and reward at its very best. 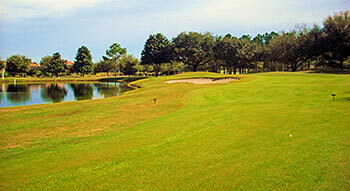 The back nine is very strong, especially from the fantastic 12th hole; a par-5 known as Alligator Alley – with a daunting drive to a tree-lined fairway. The 14th is well worth a mention too; a great nearly 90 degree dog-leg to the left with a tricky two tiered green and just the one bunker awaiting any approach too short – a hole that you will want to play again and again. Two strong holes complete the course; the 17th a par-4 where the second shot is key with the lake eating in to the green from the left and then the final hole can stretch to 561 yards and although pretty straight is no simple par, the difficulty is underlined by the SI of 5. My advice to those who have played many of the Orlando courses and are looking for something a little different, then get out to Mission Inn, this course is good and in my opinion the old course at the resort; El Campeon is even stronger than Las Colinas.